10th of July. Tonight will be a special night. A magical moment, for an amazing girl and I wish to render only the best of me. Even though it is one day earlier, somehow, someway, I was convinced that she surely appreciate engaging her birthday eve with me and I, in good conscience, did not wish to miss the countdown. Hence, I stated on the card, that I will pick her up at eight, be ready and look good. After making sure everything runs smoothly at the florist, I thenceforth went to pick up a little present for the birthday girl. With certainty, through all this, I began to apprehend that I am being taught to realise how essential Farah is to me. Promptly at eight in the evening, I rang her bell and there she was, standing in her beautiful dark green dress, my presuming hit the point. She looked miraculous with an entrancing smile, enthralling me to take both her hands and kiss them. “You look amazing,” I kissed her on the cheek, thus I got one in return. “But, on that dress, you won’t be able to climb on my bike…” She laughed. Therefore, I left my bike at her house and she drove us to the restaurant. “I thought you have a dinner date with... what's her name again.......?” I laughed when she did the 'eye thing' again. I love to see that. “Oh, she... haha. Well, actually, yes, but I told her I can’t… don’t want to miss the countdown." “It’s your important day, your night… I don’t want to miss a second.” I pulled out my e-organiser again, so did she. For a moment we were busy typing. “You do that too?” I asked. “I learnt from you.” She passed her gadget to me and I gave her mine. We laughed reading each other’s note. When I returned to the main screen, I saw a picture of us together, she selected as the wallpaper of the gadget, the photo captured by my brother during our first camp a few weeks ago. I smiled. This girl loves me. She truly loves me. “Wine tonight, Miss?” The same waiter came to take our order. “No, thanks.” We replied simultaneously, laughing. Our conversation that night was something contrastive, it was a magical touch of the bottomless soul. As days gone by, I sensed and perceived that my relationship with my best friend is growing healthier, tougher and deeper. She knows exactly how and who I truly am, handling me wisely with sincerity. Her unique ways of warming up the atmosphere encircle me around her nub. This has raised a question mark in my mind, am I in love? My best friend, sure enough, I like her and I like her more than I liked her before. I cherish every moment spent with her and those moments have embedded the pips deep within my essence. It's something nameless, an exploration. A journey without a destination. It's limitless. Togetherness is all what we aim for. Do I miss her? Yes, I do. It’s true. I don't doubt, I really do. Every day I miss her and every time it happens, my heart beats erratically just as same when I see her, no matter where, when and how… at school, at the park, by the river, the lake, everywhere. When she walks, when she talks. When she listens, when she gazes. In every simple thing she does, inch by inch, she sweeps away whatever feeling I feel about whoever else by showing me what truth truly is. I was unsure, I had no clue, but I do believe, that this intimacy has developed the affection within my heart. It has nurtured all the sense of being in love, left me no choice but to admit that the love starts to grow. She made me smile when she called me with that cute diminutive pet name. 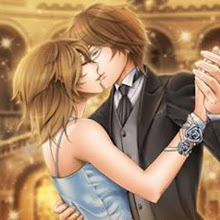 In the same song again, I took her hand and guided her to the dance floor. Sober and clear this time, I wrapped her body neatly in my arms. We twirled very leisurely, lived every step, appreciating every note played in a lovely tune. I love what I’m feeling. Staring into her eyes, I witnessed love. The tenderness made me smile and when she smiled back at me, the passion reassured my emotion to kiss her soft blushing cheek. I let myself drifter to her scent, esteeming her soft breath in my ear. My heart raced, shivered… affection was the only thing permeated my conscience. Should I let this out? I hired my intuition to uncover the ambiguity. her a birthday song. We took a place on the bench, facing the valley. Beautiful night view. Before us, there were shimmering lights while the stars twinkling up above us in the perfect night-time sky. The cool night breeze harmonised the wonders of nature, in the dim light of the moon behind the clouds. “Cold?” The bus stop scene came into my eyes as I offered her my jacket. “Thanks, hon, but I prefer your embrace.” She answered me very softly and that was definitely something I am dying to do. “Me too… I love enjoying the nature like this and you complete the night.” I brought her in my arms, holding her tight as she requested, as I'm consistently eager to do. She delivered no answer to my question other than looking at me, smiling. My query made me a little ashamed. Why did I ask her that? Wasn't I the one who supposed to own the answer? The question hung there. We both took a silent moment enjoying the spectacular night offered by mother nature until my watch finally beeped, it's time to sing her the birthday song. I kissed her forehead and then I handed her a small box. The little green box changed hands. And so I took out another box, ignited the fireworks that I bought exclusively for this occasion. Eighteen shoots, for her eighteenth birthday. Instead of typical birthday cake and candles, this special girl should be lavished with an unsurpassed care and concern. I hugged her closely in my arms, singing her the birthday song again. “This is fantastically beautiful, Ray… the happiest moment in my life, the most pleasing birthday I have ever had. Truly, thank you for being so endearing to me. Thank you, Sayang…” She said with a grin and eyes glowing. The bliss mirrored on her face. Her arms embracing my neck. “Shhh…” I laid my forefinger on her lips, gently caressing her face and kissed her, underneath the shooting fireworks, beneath the stars twinkling high above. Adakah aku merinduinya? Ya, memang benar. Tidak aku ragu, dia benar-benar aku rindu. Setiap hari aku merinduinya dan setiap kali ia berlaku, hati ini berdegup tidak menentu sama seperti setiap kali aku melihatnya, tidak kira di mana, bila dan bagaimana ... Di sekolah, di taman, di tepi sungai, di tasik, di mana-mana sahaja. Apabila dia berjalan, ketika dia bercakap. Apabila dia mendengar, ketika dia menatap. Dalam setiap perkara kecil yang dia lakukan, inci demi inci, dia telah menyapu apa sahaja yang aku rasa tentang sesiapa saja dengan menunjukkan aku apa sebenarnya kebenaran. Dulu aku tak pasti, tak berpetunjuk, tapi kini aku percaya, bahawa kemesraan ini telah mengembangkan satu rasa paling indah dalam hati aku. Ia telah memupuk semua rasa kasih dan sayang, meninggalkan aku dengan tiada pilihan, selain mengakui bahawa cinta mula berkembang.